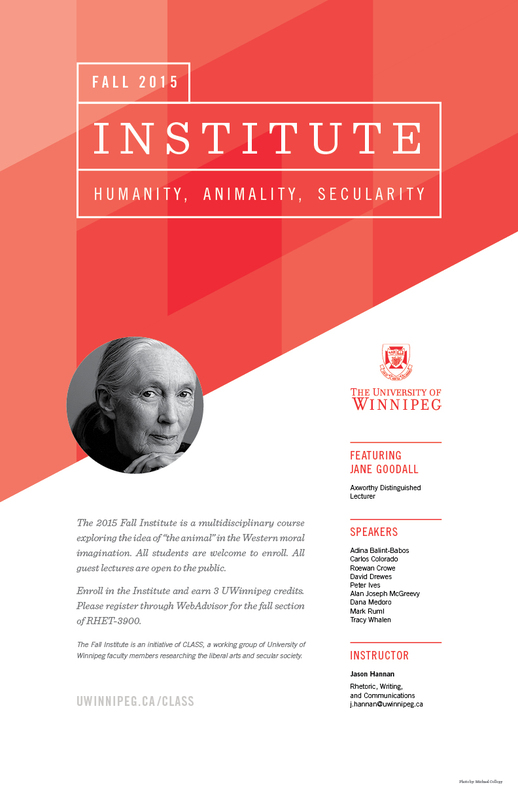 Speaking in conjunction with our Institute "Humanity, Animality, Secularity"
The 2015 CLASS Fall Institute "Humanity, Animality, Secularity" will explore the idea of “the animal” in the Western moral imagination. This course will consider the different ways in which Western humanism, ethics, and secular society have failed to come to grips with the place and status of animals in our world. We will begin by examining how the moral status of animals has been understood in Western thought. We will interrogate the standard arguments used to uphold the human-animal distinction, including the idea that the power of speech, communication, and reason confers a special status upon humanity. We will examine how moral rhetoric and discourse overwhelmingly focus on people to the exclusion of animals. Students will engage a wide range of writings, both non-fiction and fiction, addressing “the question of the animal. CLASS was pleased to host Dr. Jane Goodall as the second speaker in The Axworthy Lecture Series on Social Justice and the Public Good. Her lecture on Friday, September 11, 2015 was open to the public and delivered to a packed house of 2500. The lecture will be broadcast on October 7 as an episode of IDEAS on the CBC Video of the event will also be available on this page soon, so stay tuned! The work of Dr. Jane Goodall challenges modern secular conceptions of ethics and justice, which overwhelmingly focus on human rights. By bringing the rights of non-human animals to the forefront of our consciousness, Dr. Goodall compels us toward a post-humanist conception of social justice.